At the University of Oklahoma Health Sciences Center, researchers across campus devote each day to cutting-edge investigations that result in important discoveries and medical innovations. Many of these achievements can be directly attributed to the generous support of the Presbyterian Health Foundation. The Oklahoma City-based Presbyterian Health Foundation was formed from proceeds of the sale of Presbyterian Hospital in 1985. A key component of OUHSC’s research success is due to the collaboration that PHF established with OUHSC through the PHF Research Grant Program. This grant program has allowed researchers to grow their pioneering concepts into major research projects that attract federal funding. The PHF program has enabled collaborations between clinicians and basic scientists, each contributing expertise toward solving a medical problem. The grant program also has provided grants to develop the projects of talented junior faculty members and has provided infrastructure support for faculty to continue their research projects. Among the success stories stemming from PHF funding is the research of Doris Benbrook, Ph.D., whose work has focused on the development of drugs for the prevention and treatment of gynecologic cancers. In 2014, Benbrook was awarded a PHF grant to continue her investigation into the anti-cancer compound OK-1, a drug she developed that shows promise for killing cancerous cells while not harming healthy cells. Benbrook discovered that OK-1 causes changes to a protein called mortalin only in healthy cells and not in cancer cells. 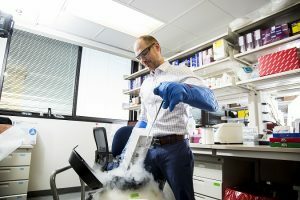 With this result in hand, Benbrook has leveraged her PHF funding to attract more than $7 million in grants from the National Cancer Institute and is preparing to launch a first-inhuman clinical trial for OK-1. PHF funds also help new clinician-scientists who will be instrumental in developing clinical treatments for devastating diseases. Junior faculty member Matlock Jeffries, M.D., received a PHF award for his research into how changes in an individual’s genes over time can result in chronic, debilitating osteoarthritis. With discoveries made possible by his PHF funds, Jeffries secured a five-year career development grant of more than $900,000 from the National Institutes of Health. Since the inception of the PHF Research Grant Program, PHF has awarded $75 million to researchers at OUHSC and has committed an additional $2.95 million for 2018. This investment has helped OUHSC researchers to compete at the national level, resulting in approximately $42.6 million in extramural funding to date. This funding has made a critical difference for researchers spanning OUHSC, including those from the Colleges of Allied Health, Dentistry, Medicine, Nursing, Pharmacy and Public Health. “We are grateful for the unique opportunity that Presbyterian Health Foundation funding provides to OUHSC and its researchers,” said Vice President for Research James Tomasek, Ph.D. “PHF’s commitment to our research projects shows its foresight and dedication to improving the health and wellbeing of people in Oklahoma and to promoting a vigorous and innovative biomedical research enterprise. Read the full article and more in OU Magazine – Spring/Summer 2018.